Earlier today I posted new information on organizations that received USAID and State Department grants this fall. 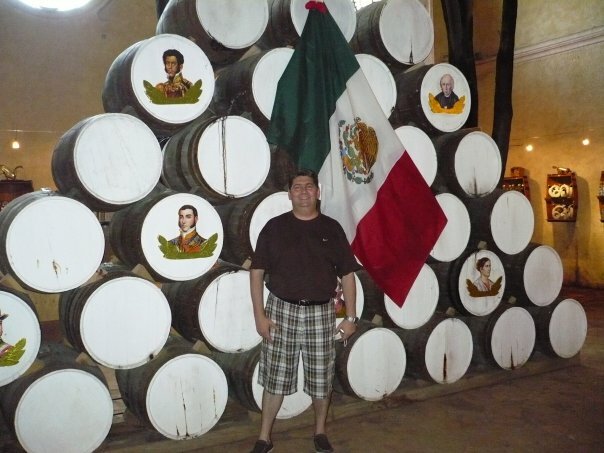 See post entitled, "More details on $18 million in Cuba grants." 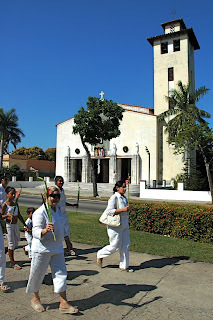 I also wrote a post about the Foundation for Human Rights in Cuba. 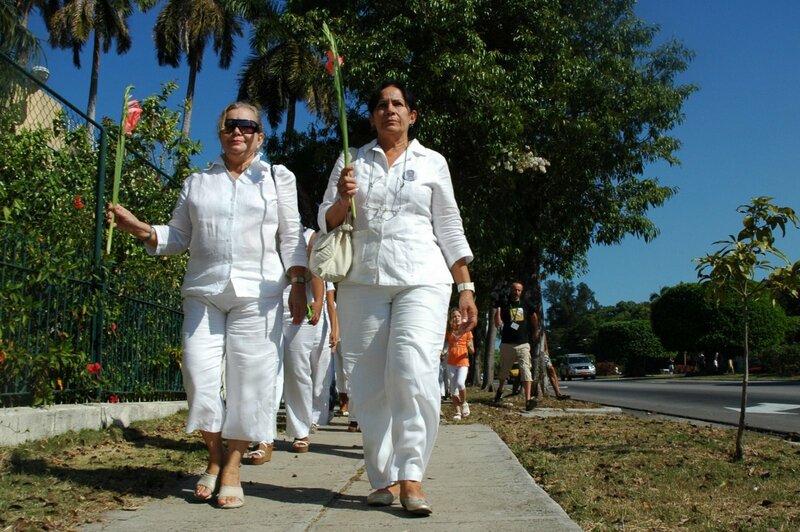 See "Cuba Money Trail: Tale of two Miami non-profits." Several readers over the past few weeks had asked me to write something about a new award given to the FHRC. As I looked into that, some other grant expenses caught my eye. The Directorio Democratico Cubano, a non-profit in Miami, reported to the IRS more than $13.5 million in expenses from 2005 to 2009. A Seminole Indian who spoke out against the U.S. ban on trade with Cuba at the Cuban Interests Section in Washington, D.C., does not represent tribe, Seminole Tribe Chairman James Billie said in an Oct. 26 letter. 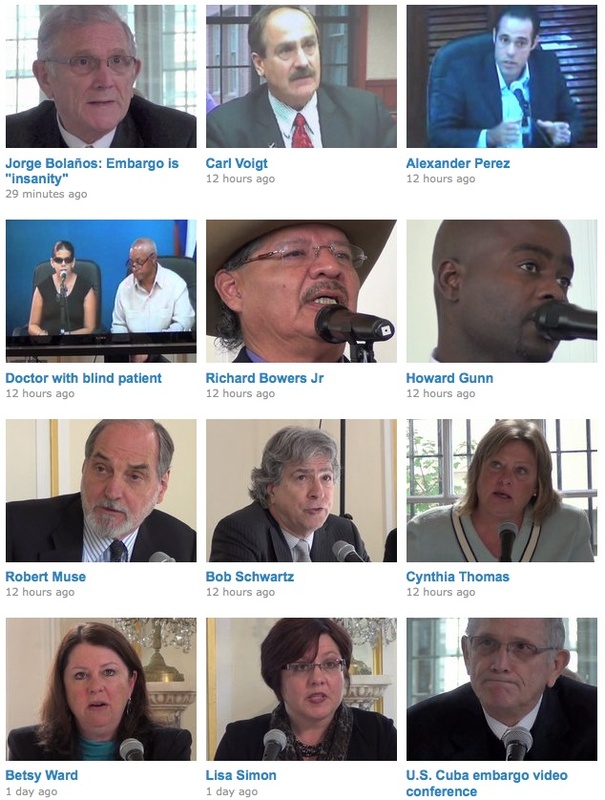 Richard Bowers Jr. was described as the tribe's "ambassador of economic affairs" when he criticized U.S. policy toward Cuba at an Interests Section conference (see videos of event here). 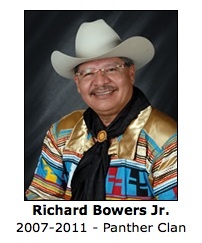 ...the comments of Mr. Bowers in no way represent the sentiment or opinions of the Seminole Tribe of Florida. Mauricio Claver-Carone, editor of Capitol Hill Cubans, wrote that he was surprised to hear Bowers' rhetoric since the Seminole Indians have "been historically sympathetic to the plight of the Cuban people under Castro's dictatorship." 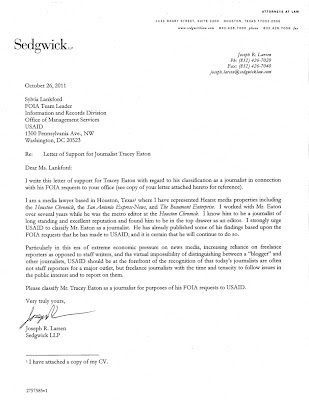 H/t to media lawyer Joseph Larsen, who wrote a letter to USAID in support of my efforts to obtain documents related to the agency's Cuba programs. Download Larsen's letter and attachments here. For more about the wrangling over the Cuba-related FOIA requests, see this Cuba Money Project post, "USAID turns tables, demands reporter’s contracts." The Cuban delegation. 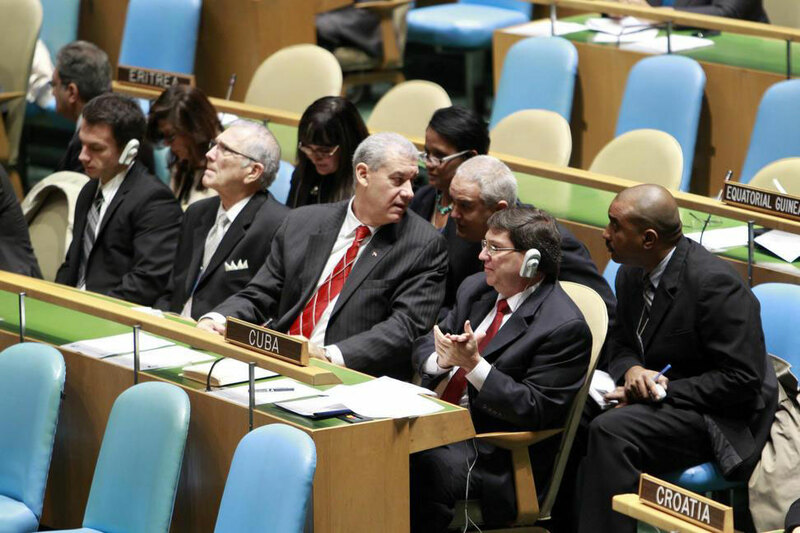 Photo: the U.N.
186 nations voted in favor of a resolution condemning the embargo. Three countries abstained: the Federated States of Micronesia, Marshall Islands and Palau. Two nations voted against: the United States and Israel. Cuban ambassador: U.S. embargo is "insanity"
WASHINGTON - America's half-century-long ban on trade with Cuba is "un-American" and should be eliminated, Cuban ambassador Jorge Bolaños Suarez said Friday. Speaking at a video conference with officials in Havana, Bolaños said the U.S. trade embargo causes economic, moral and spiritual harm. He said the sanctions cost American businesses billions of dollars in lost sales per year. But it's not just an economic issue, he said. It is a matter of heart. The blockade should be eradicated. It is so un-American to keep a policy in place that has not worked for a half century. The policy is defined in many ways - one way is insanity. 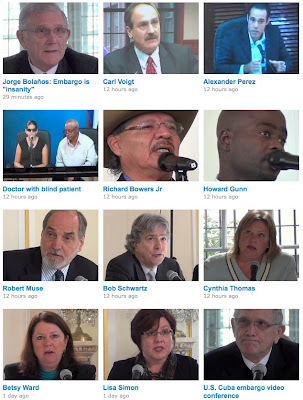 I posted video clips of the conference at Along the Malecon's Vimeo channel. Marco was born in Miami in 1971 to Cuban exiles who first arrived in the United States in 1956. 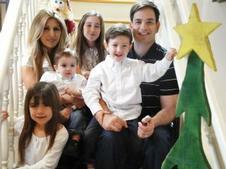 The Washington Post on Oct. 20 accused Rubio of embellishing his family history to enhance his political appeal. His official biography said his parents, Mario and Oriales Rubio, “came to America following Fidel Castro’s takeover." 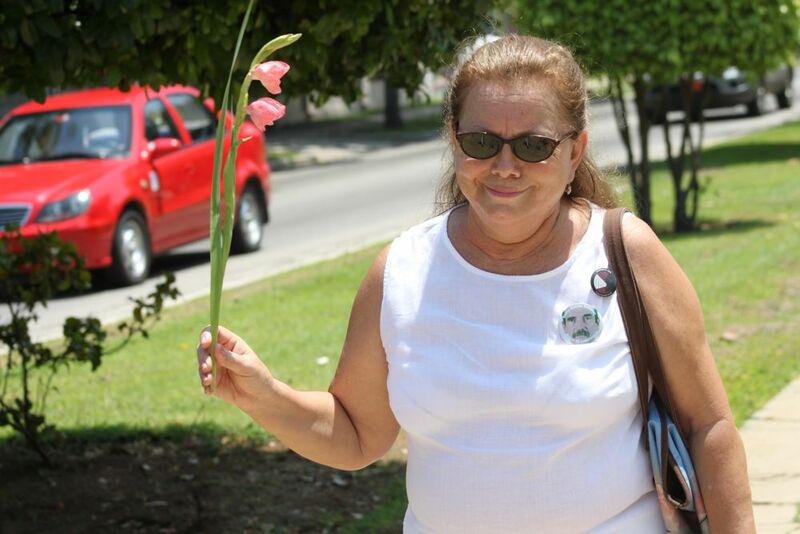 Laura Pollán was a human rights crusader who fought to expand basic liberties in Cuba. Her deep desire for change drove her. 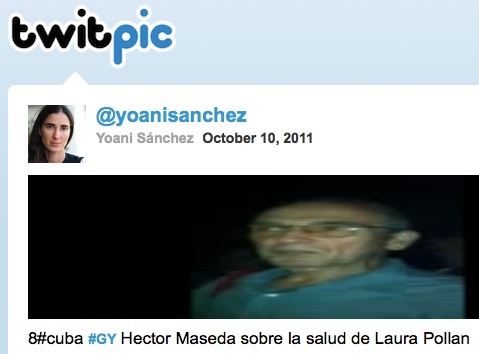 But there was something else motivating her: Her love for her husband, Héctor Maseda. Maseda was a journalist who was jailed in 2003. 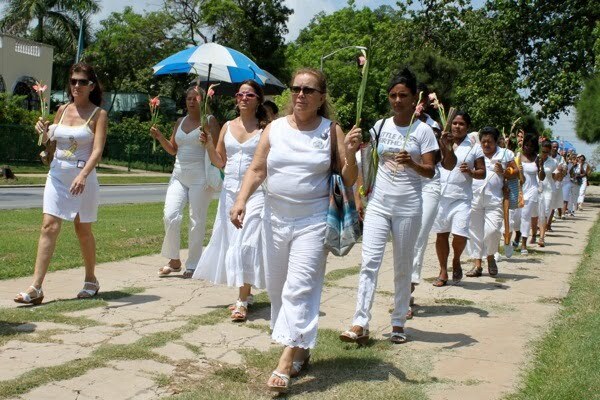 Pollán founded Las Damas de Blanco to push for the release of not only Maseda but 74 other dissidents, democracy activists and journalists jailed as part of the so-called Black Spring crackdown. 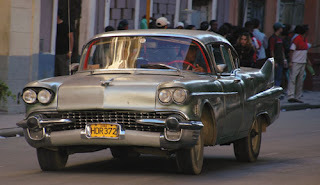 I have a ton of Cuba videos to post. I wanted to have them all up by now, but I feel behind. I'll get them up as soon as I can. 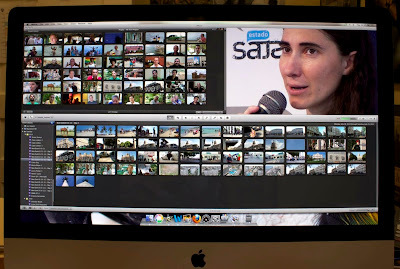 Meantime, here are photos showing clips of some of the videos that await. indicated that the two physicians who care for Pollán in intensive care at Calixto Garcia Hospital, in Havana, confirmed Friday to the family that the leader of the Damas de Blanco has dengue, in addition to being affected Respiratory Syncytial Virus (RSV). Dengue fever is a severe, flu-like illness that affects infants, young children and adults, but seldom causes death. In 2007 alone, there were more than 890 000 reported cases of dengue in the Americas. It arrived by certified mail and had a $7 stamp, but contained almost no information. The U.S. Agency for International Development, or USAID, released the first document I've gotten in response to a series of FOIA requests I began making on Dec. 28, 2010. 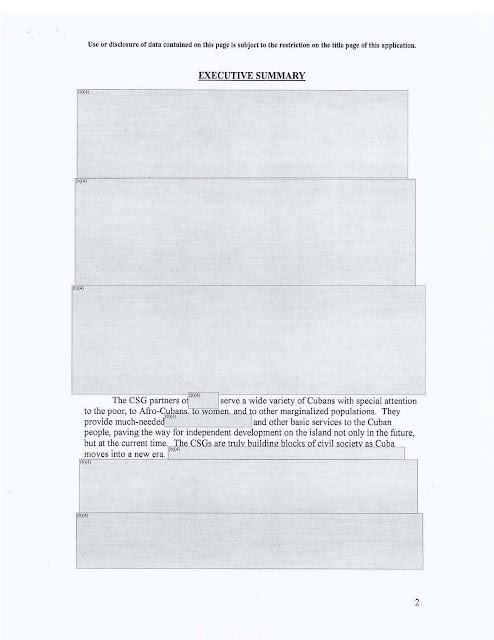 The 33-page Cuba project proposal was heavily redacted. See post about it here, at the Cuba Money Project. Download the redacted document here or view it here. See reaction from an ex-USAID official here. In the document, USAID reveals only bare details of a $2-million Cuba contract, keeping secret most details about the program, including the name of the organization that received the contract. Employees associated with the U.S. Government could be subjected to threats, intimidation, harassment and/or violence. Further, if we were to allow the security of our implementers and their employees to be compromised, all of USAID’s programs worldwide and USAID’s relationships with its implementers could be jeopardized. The U.S. government awarded $8,656,177 in Cuba-related grants to nine companies in September, federal records show. Eight are non-profit organizations, most of them large, established outfits. One company, Creative Associates International, is a for-profit firm and a top recipient of U.S. foreign aid money. Curiously, three non-profits - the International Relief and Development, the International Republican Institute and the Pan American Development Foundation, each received the same amount - exactly $693,069. One organization, the Institute for War & Peace Reporting, or IWPR, looks like a newcomer to Cuba projects. It has received $3,118,058 in State Department grants since 2007 for work in Afghanistan, Azerbaijan and the Philippines, records show. The most important thing, my impression of her... She looked very good. She's fighting. I transmitted more strength to her. He said his overall impression after visiting Pollán was "very positive." 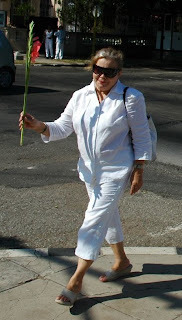 Maseda is a former political prisoner whose imprisonment inspired Pollán to help start Las Damas de Blanco, dedicated to freeing all political prisoners. 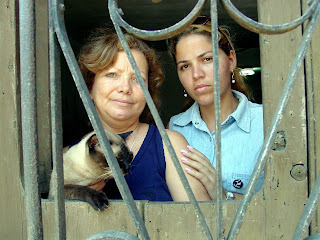 Laura Pollán: "Very soon Cuba will be free"
They’ve hit us. They’d kicked us. We’re going to continue. We know we’re in the right. Very soon Cuba will be free. People are waking up. To download a mobile version of the Pollán interview, right click on this link, then select "Save link as." I filed a Freedom of Information Act, or FOIA, request asking the Treasury Department to send me an updated list. I'll post it if I get it. 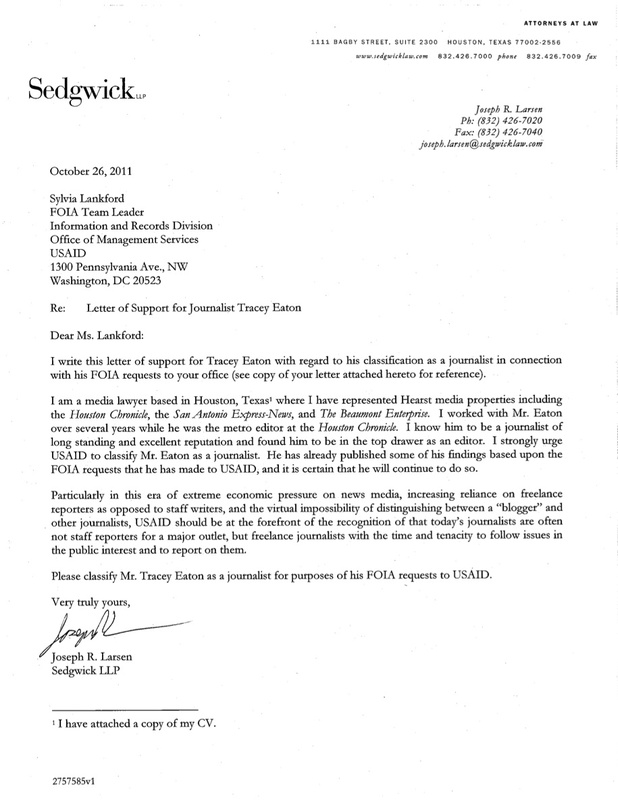 I submitted the FOIA request electronically. A PDF copy is here. 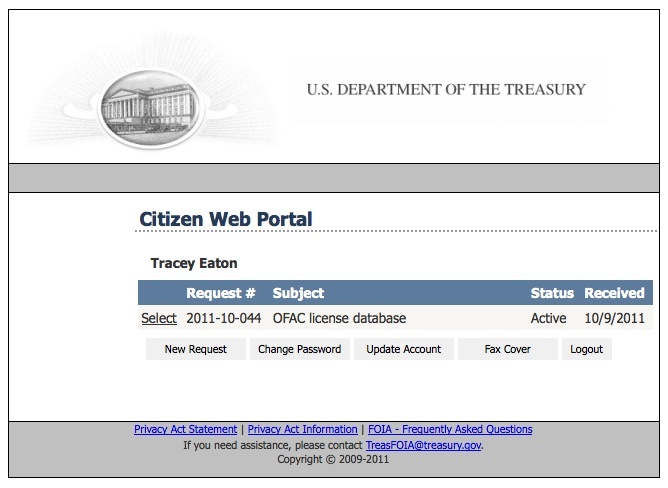 The Office of Foreign Assets Control, or OFAC, a branch of the Treasury Department, administers the licenses. 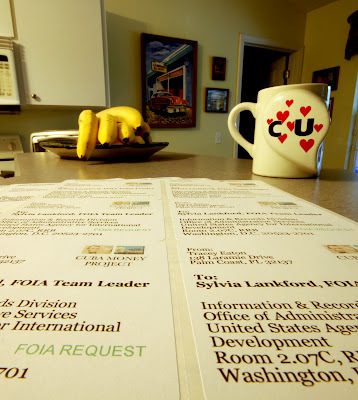 The kitchen counter turned out to be the best place to organize about 100 FOIA requests that I dropped in the mail today. The FOIAs are aimed at getting copies of government contracts related to democracy promotion and civil society projects work in Cuba. The letters are in a public Google Docs folder in case you want to see them. Also on Google Docs are more than 140 federal audits that I've been going through to find Cuba money. 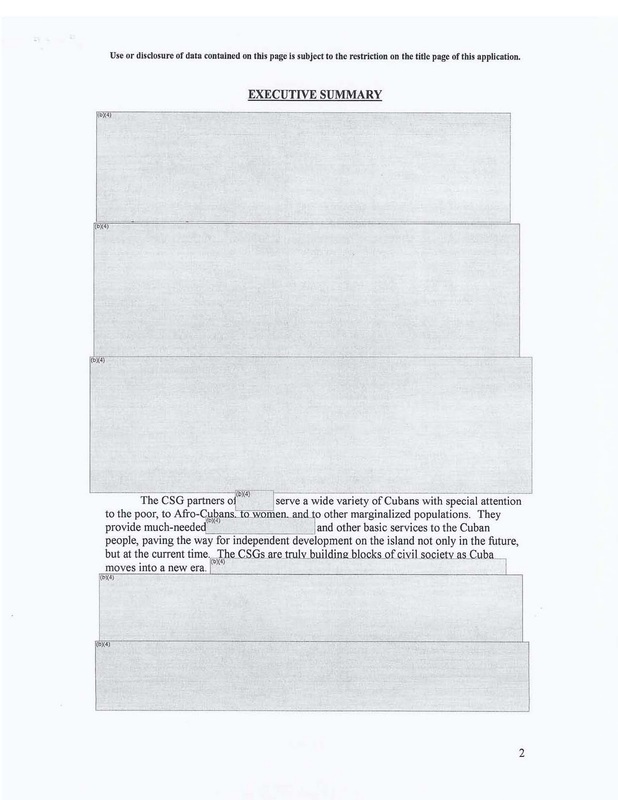 There's a brief explanation and links at the Cuba Money Project's FOIA Tracker. More to come. 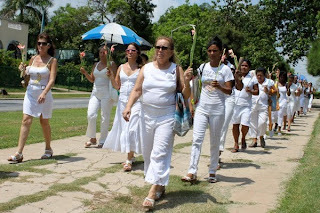 Martha Beatriz Roque - via Hablalo sin Miedo - said that the spokeswoman for the Ladies in White, Laura Pollan, has been admitted to the emergency room of the "Calixto Garcia" Hospital with respiratory and blood-sugar problems, among other troubles. Beatriz Roque's 28-second audio message does not give any additional details. Above is a chart showing U.S. democracy aid to Cuba (view and download from public Google Docs page). This is a corrected version of a chart I posted on Sept. 30. In the earlier chart, I believe I overstated the amount of money that Creative Associates International had received, and understated the University of Miami money. A shout-out to Nelson Rubio for inviting me this morning to his morning news show on Actualidad 1020, an A.M. radio station in Miami. We discussed a U.S.-financed text-messaging campaign targeting Cuba. 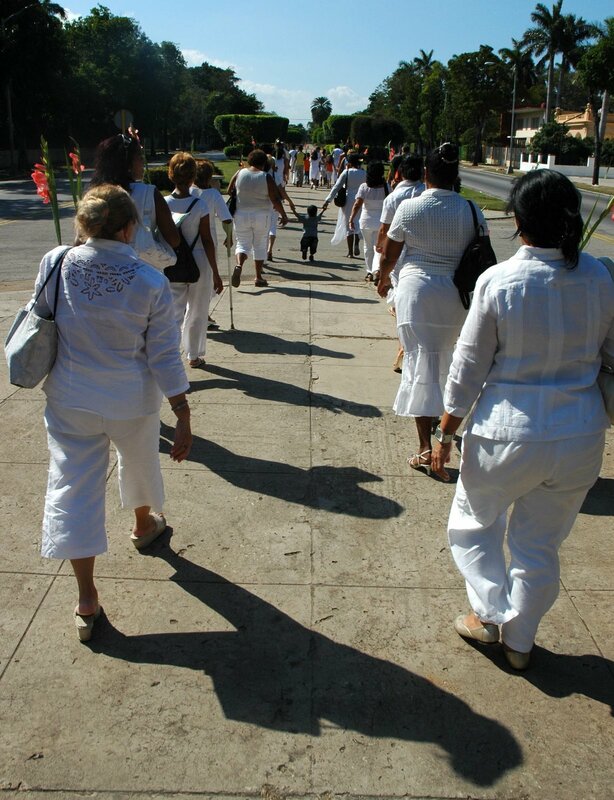 State-run media organizations in Cuba have characterized the planned messages as spam. I don't agree. A description of the contract with Washington Software, Inc., says cell phone users in Cuba will have to subscribe to receive the messages. They'll all have user names and passwords. That doesn't sound like spam to me. Today I was wondering who got the $6 million USAID grant to expand access to information in Cuba. I posted an entry on the grant announcement in June. 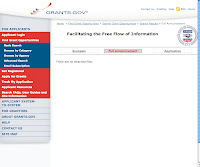 I checked Grants.gov to see if there was any new information on the program, entitled, "Facilitating the Free Flow of Information Program." 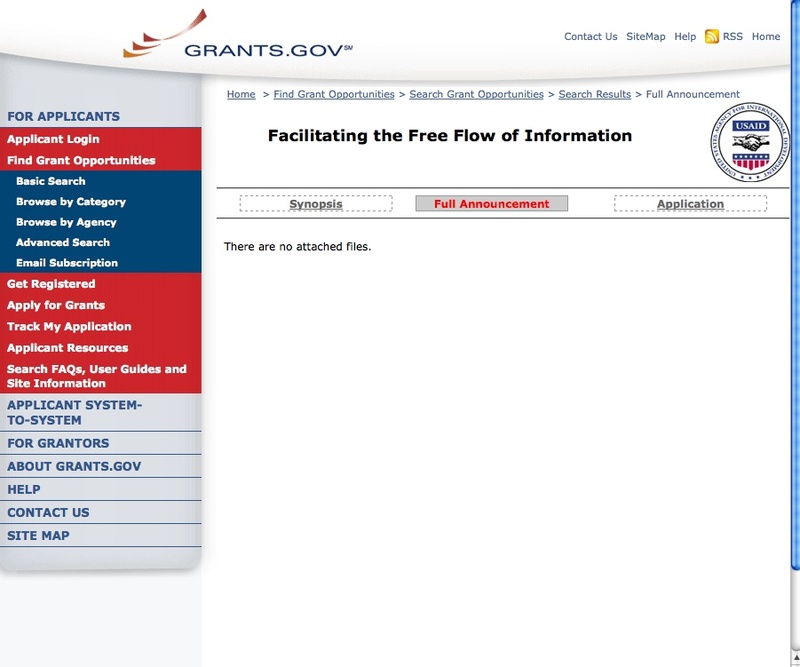 I clicked on Full Announcement so that I could download the program documents and attachments, and here's what I got: A blank page. Under a five-year $464,160 plan, a U.S. government contractor will send up to 24,000 text messages per week to mobile phone users in Cuba. 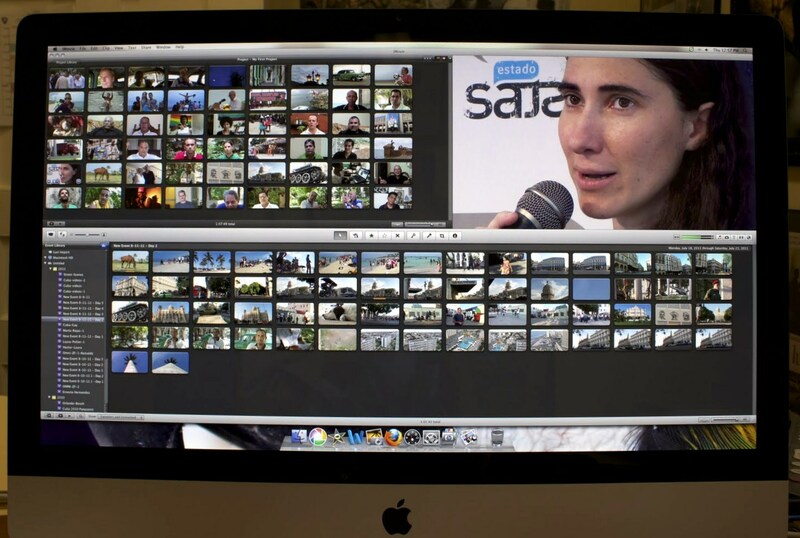 A Maryland company called Washington Software, Inc., won the contract to distribute the text messages for Radio and TV Martí. Included in the company's marching orders: The firm must develop a system that will trick Cuban government censors so that all the text messages get through to cell phone users, no matter how sensitive the messages are. Initially, the company must be able to send 24,000 messages per week. That amount could increase, depending on conditions and events in Cuba. The messages would evidently go to subscribers, not random cell phone users, so I wouldn't characterize this as text-message spam. 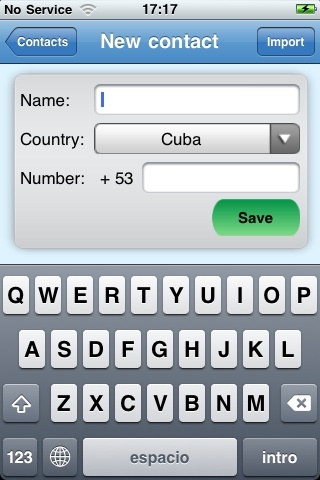 Read more at the Cuba Money Project. P.S. Ernesto Hernandez Busto at Penultimos Dias kindly points out that another text-messaging service exists: Cuba Sin Censura, which sends news headlines to cell phone users for free.